Fun round roads as well as the track. And you’ll turn heads without being called a wanker too. Miss 4: I love blue car! I so excited! The wife: Mid-life crisis already? Mother in law: I like the blue colour. Random female friend: Take me for a ride, please? The old one was awesome on paper but a bit Subaru-ish to behold. 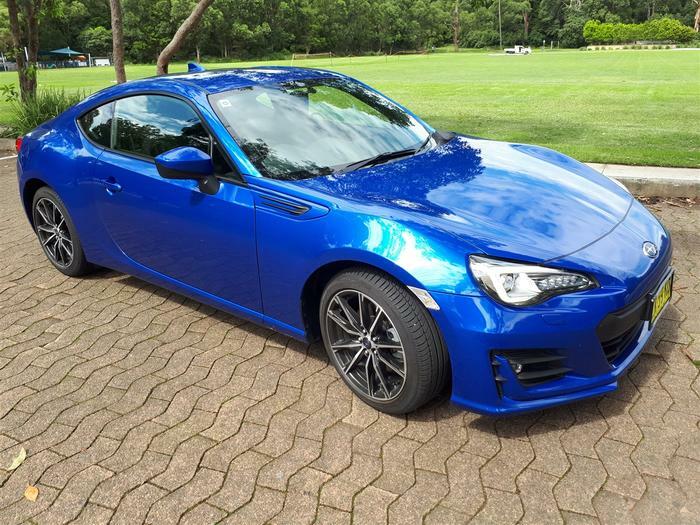 This is Subaru’s best-looking car ever. Love it. 2 litre Petrol. Seven-speed manual. We noted the narrow tyres and worried about traction. But even in torrential rain, this thing sticks to the road very impressively. We tried turning traction control off once on a wet street. We didn’t do that again. But people who like to go sideways round tracks will have a big smile on their faces. We worried that the sporty suspension would ruin our middle-aged backs but were pleasantly surprised – only serious potholes hurt us but most of the time we used the very nimble steering to avoid those… even at speed. It shifts off the mark and sounds great doing it – whether via the well-tuned exhaust note or synthetic internal engine noise. The manual gearbox was well at place here – long journeys didn’t require much changing while around town it was comfortable. It’s low slung but feels quite wide. The bucket(ish) seat was a bit tight for our oversized backsides but wasn’t uncomfortable long journeys. Compared to the Mustang EcoBoost, it felt as fast, massively more nimble and significantly safer in both a straight line and going around corners. There are four seats but you’ll need to decide whether front or back passengers are allowed to have legs. 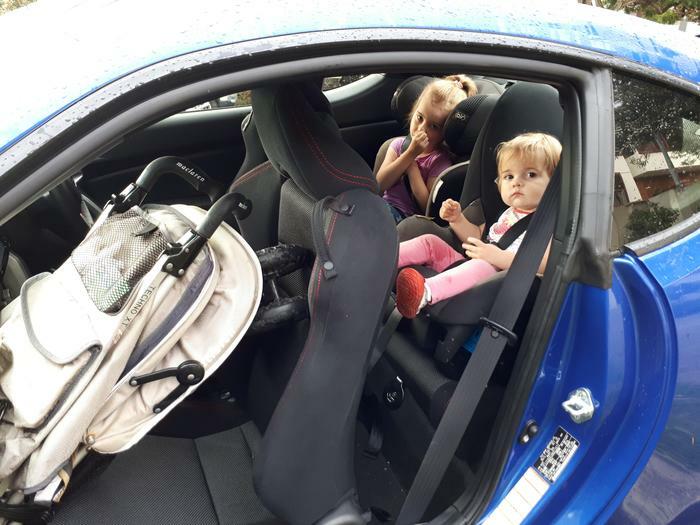 If the wife wonders WTF you are doing driving such a car, you can point out that it’s a fully-functional family saloon that fits the kids in with car seats. The dials feel quality and the stitching looks good. The big hand break practically yells at you to go round bends sideways but otherwise isn’t too intrusive. The boot is quite generous and has a full-sized spare wheel. It’s hard to look elegant when getting in to (and especially out of) it. A decent six-inch control screen worked well enough and easily provided access to phone apps but there’s no GPS. Dual air con was a bonus. Much can be controlled from the steering wheel. Would you buy one instead of a 10yr-old, manual Subaru Forester? I so want to say yes, but with three adult-sized people in the family (and two small kids) we just ain’t going to fit. Also, going off road, while fun, is a smidge impractical. We can say that zooming around a track will be great fun but as a day to day runaround it’s great too. Quick off the mark and darting for gaps at low speeds makes basic driving chores much more fun. And you’ll turn heads without being called a wanker too.